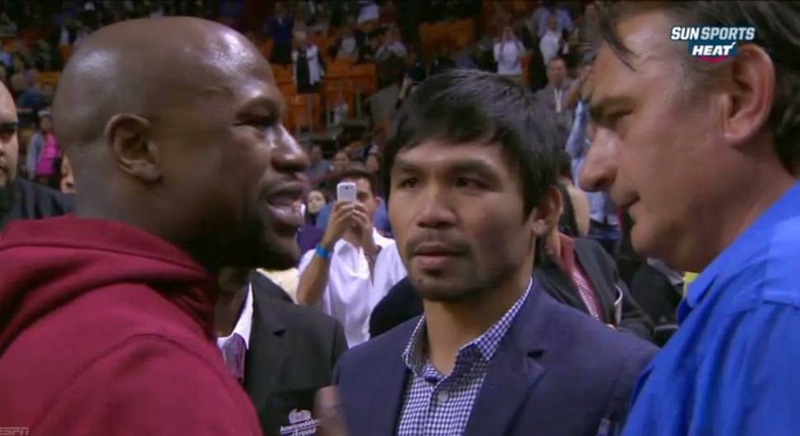 Filipino Superstar Manny Pacquiao and the no.1 pound 4 pound Floyd Mayweather met at the game between the Miami Heat vs the Milwaukee Bucks yesterday January 28, 2015 (PHT). Pacquiao said that Floyd just gave his mobile no. to so they can communicate. But the other said that Floyd tells Manny to stop lying about the signed contract. After the meet at the American Airlines Arena in Miami, Florida, Mayweather visits Pacquiao at his hotel to have a face face talk about the most exciting fight and Friends said that they had a long talk. Mayweather vs Pacquiao seems likely to happen on May 2nd.